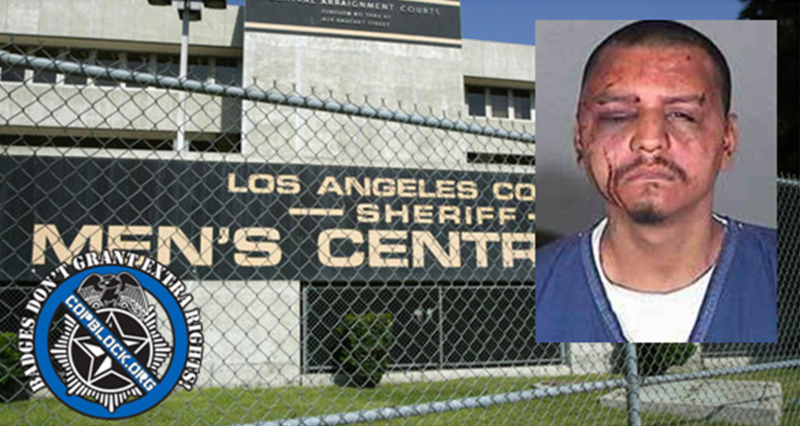 Five deputies with the Los Angeles county sheriff’s department have been tight lipped since 2010 when federal authorities first launched investigations into a jail beating ring that targeted visitors of inmates. Federal prosecutors allege the deputies beat visitors to the Los Angles county jail in a windowless, secluded room and then wrote false reports claiming the victims had instigated violence. Now, two of those officers have broken ranks and signed plea agreements, meaning they could be utilized by prosecutors to testify against other officers, the Los Angeles Times reported Monday. Officers Noel Womack and Pantamitr Zunggeemoge reached a deal regarding the primary case in question which involved a man visiting his brother in the Los Angeles County Jail in 2011. At the time, officers claimed that Gabriel Carillo had fought with them in a waiting area and had to be restrained. The five deputies involved in the struggle denied the man’s allegations that he had been handcuffed and beaten without cause. Deputy Womack ended years of denial by admitting officers did in fact brutalize Carillo, who was handcuffed and held to the floor in a room at the sheriff’s department’s main jail facility. Carrillo was attacked on Feb. 26, 2011, after deputies found him carrying a cellphone in the waiting area, a violation of jail rules – a civil-rights lawsuit filed by the man says. After discovering the cellphone, deputies said they handcuffed Carrillo and escorted him to a booking room. The officers claimed that when they released one of Carrillo’s hands for fingerprinting, he swung his elbow at them before a supervisor ordered the deputies to use force and restrain him. Carrillo alleged in his lawsuit, however, that both of his hands were handcuffed behind his back the entire time and the attack was unprovoked. He said he was beaten until he blacked out and then, when he came to, was sprayed with mace. Carrillo was charged with battery, resisting deputies and attempting to escape arrest. He faced up to 14 years in prison, but all charges were dropped against him a week before trial. Deputy Womack has now agreed to plead guilty to a felony charge that he lied to FBI agents when he said he did not know if Carillo was handcuffed or not. Deputy Zunggeemoge, who had faced allegations of abuse and dishonesty, also entered a guilty plea earlier this year, court records show – but that agreement with prosecutors was sealed by a judge, keeping its contents secret. The plea deals mark the first time in two decades that a sheriff’s deputy has been convicted in federal court of crimes related to excessive force. The five deputies begin their criminal trial on 16 June. Prosecutors have painted Sergeant Eric Gonzalez as the ringleader of the group, who fostered abusive behavior against inmates and their visitors. Gonzalez, as well as the other implicated deputies, Sussie Ayala and Fernando Luviano, maintain their innocence and have pleaded not guilty. In the civil-rights lawsuit, approved and finalized by the Los Angeles County Board of Supervisors last year, Carillo was awarded $1.2 Million. Carrillo, pictured above, said he suffered a broken nose, extreme bruising, and facial paralysis as a result of the incident, but has since recovered with no permanent damage.